A weekend in the mountains is just about the best thing in the whole world, don’t you think? 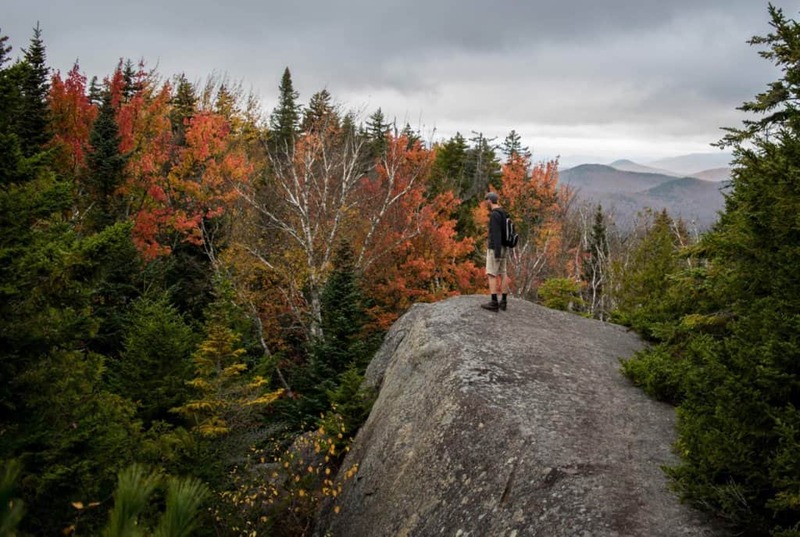 A few weeks ago, we had the opportunity to do some leaf peeping in the Adirondacks. Over the course of three days, we explored the towns of Keene, Jay, Wilmington, and Lake Placid, New York. 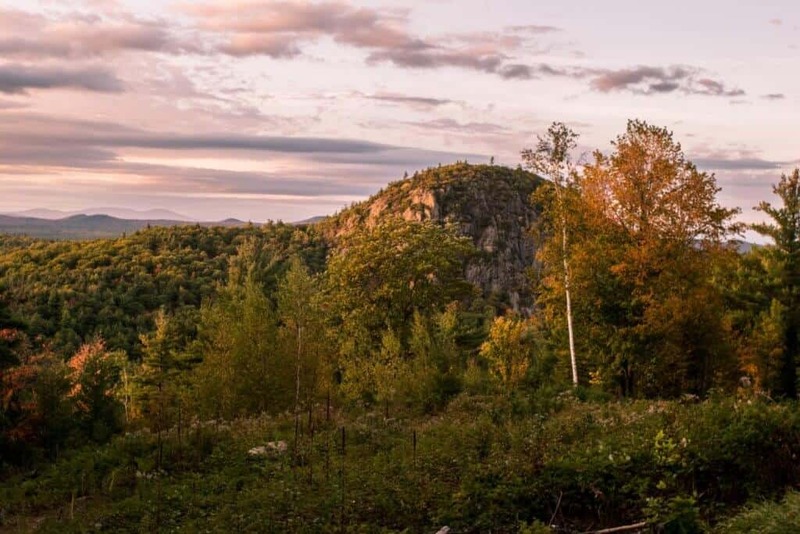 The area is famous for its high-peaks hiking, and while we didn’t actually make it to the top of a high peak, we did manage to squeeze in a few spectacular day hikes. The highlight of our mini vacation was definitely our luxurious hideaway at Adirondack Star Ridge. We stayed for two nights, and were treated to a magical campfire, spectacular views, and unseasonably warm weather. I’ve been here in the summer and the fall, and I have to say there aren’t many places that can top autumn in the Adirondacks. Disclosure: Adirondack Star Ridge graciously hosted our stay in exchange for some photography work. This is an honest review of our experience — we will only recommend places we fall in love with. This post may contain affiliate links. If you click on the link and make a purchase, we will make a small commission. Thank you for supporting Back Road Ramblers. 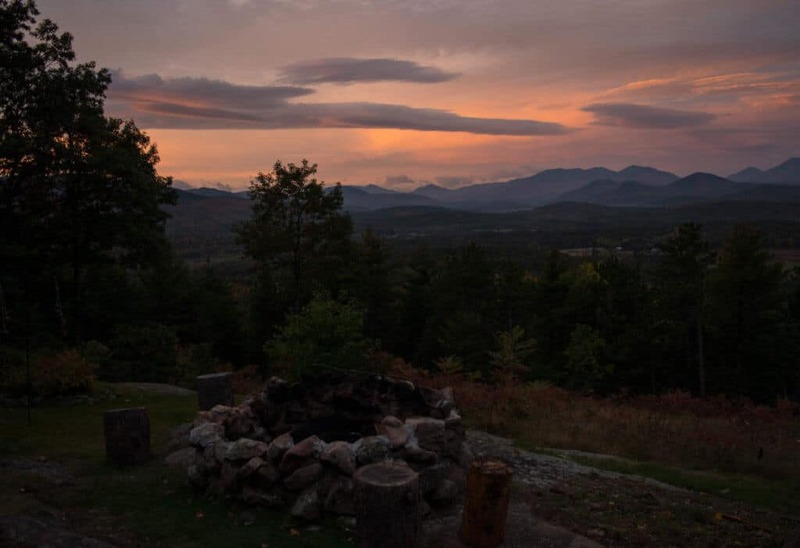 Adirondack Star Ridge is actually a collection unique rental properties situated on a high ridge with a fabulous view of Whiteface Mountain and the Adirondack High Peaks. 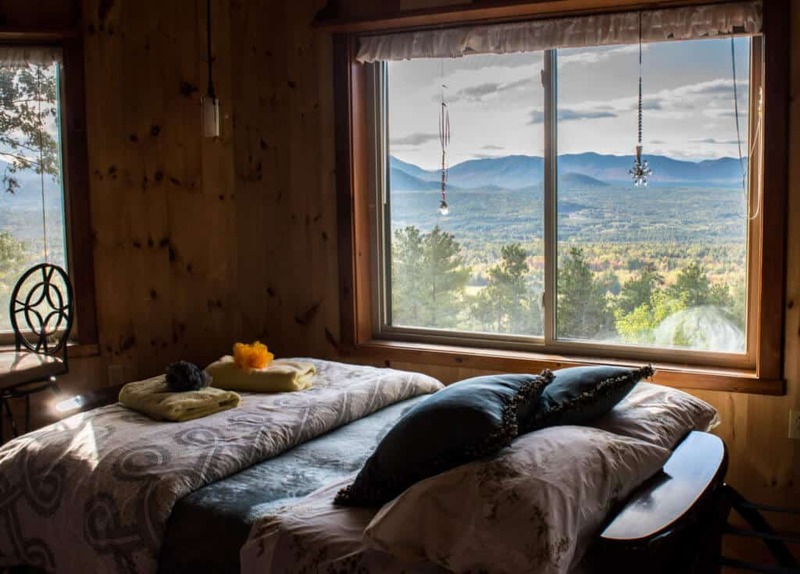 Located in Au Sable Forks, New York, these Adirondack cabin rentals are close to incredible hiking trails, the bustling village of Lake Placid, and the renowned Ausable Chasm. 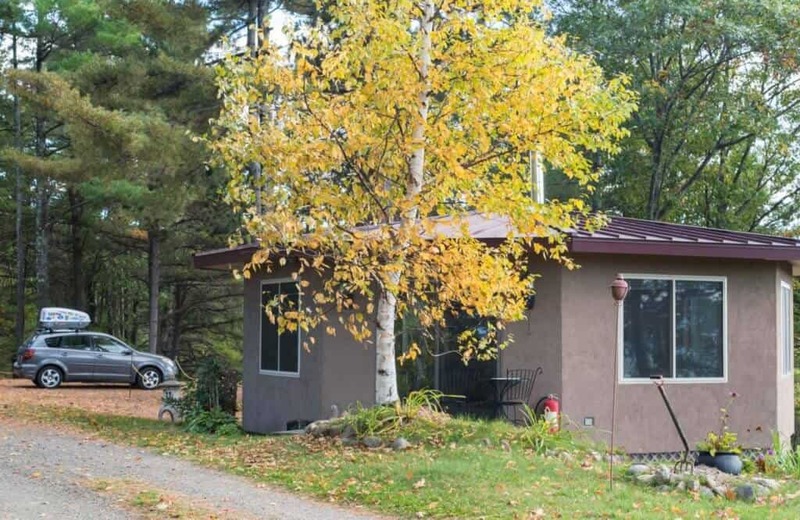 Visitors looking for Adirondack cabin rentals have a few properties to choose from. 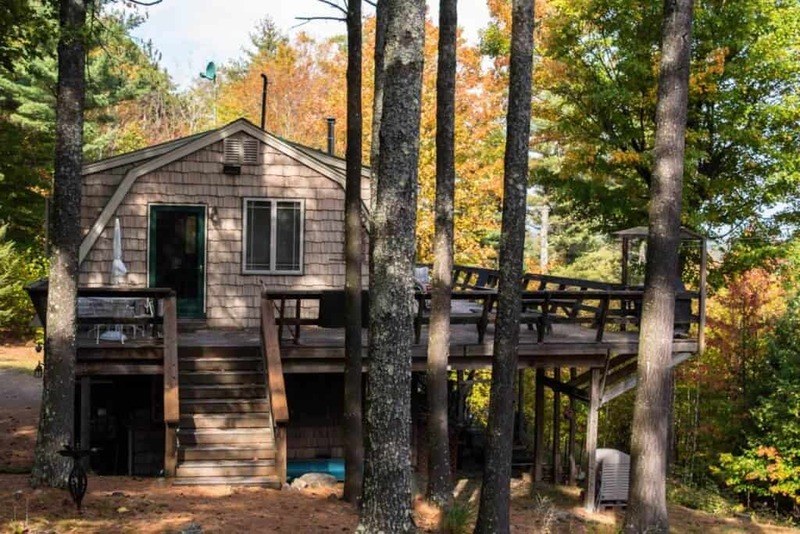 With two full bedrooms, a woodstove, full kitchen, and a wrap-around deck, this is the perfect getaway for families. 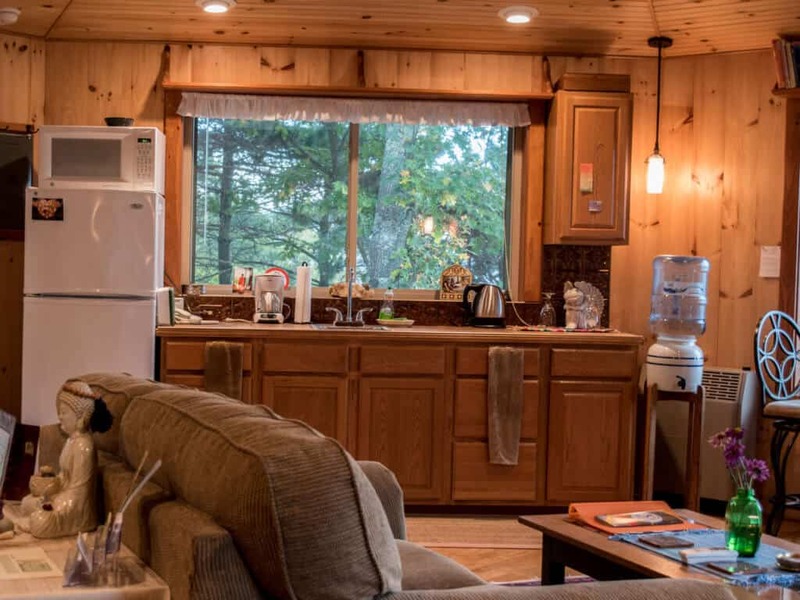 The cottage can be rented year-round and includes Wi-Fi and a flat-screen TV with Netflix. Little Star is a quaint little cabin nestled in the woods on the ridge. 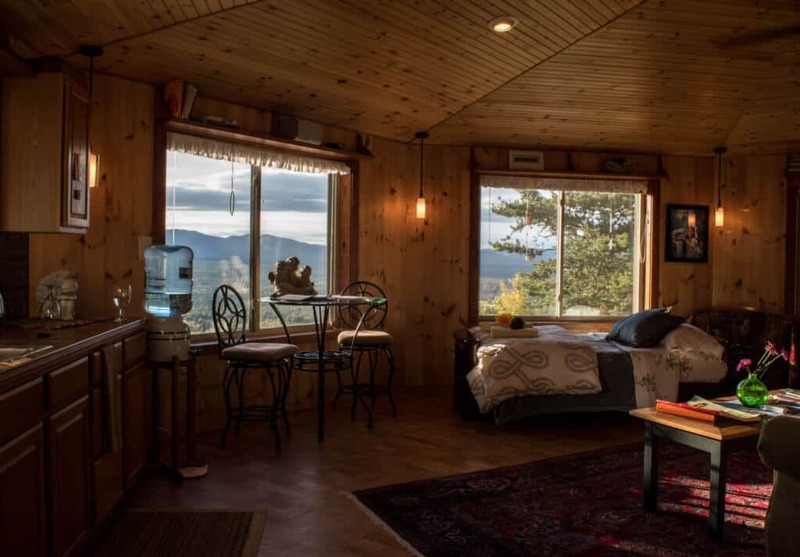 With a queen bed, a small sitting area, and windows all around, this is a great escape for couples hoping to disconnect from the rest of the world. Little Star guests share the upscale outhouse and outdoor shower with the studio guests. 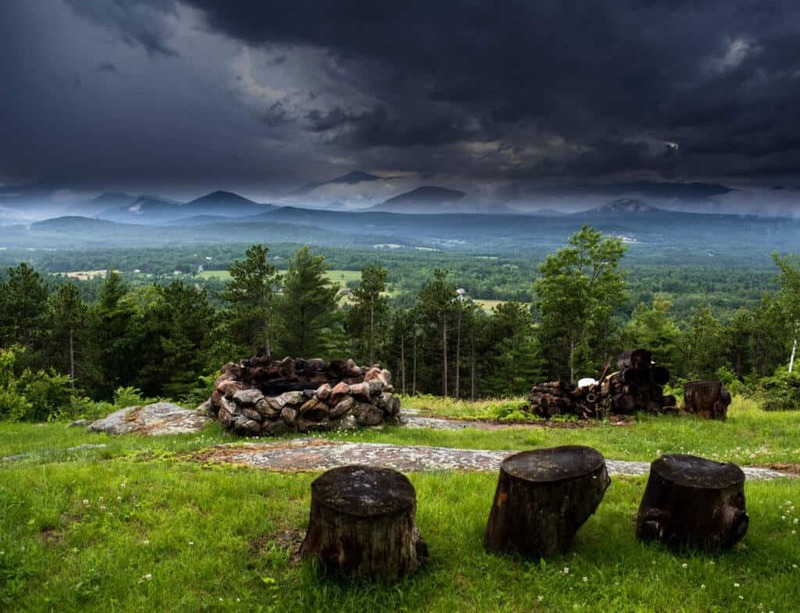 For the most awesome 360 degree views of the Adirondack Mountains and forests, Star Ridge Studio is the place to be. The spacious octagonal cabin is perched on the ridge, and includes all the comforts of home. You can read more about our studio stay below. Perfect for solo travelers and couples, Ensuite is spacious bedroom in the main house. The space includes a queen bed, bathroom, and outdoor sitting area with a private entrance. Guests have access to the shared kitchen. 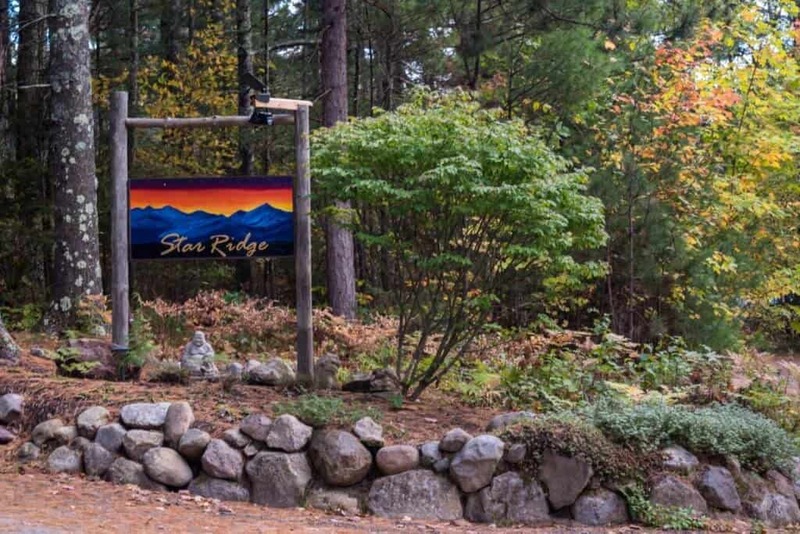 All guests are welcome to explore Star Ridge’s 30 acres, plus thousands of acres of adjoining wilderness. No matter which property you choose, the views are incredible. We are partial to Star Ridge Studio and have stayed there twice. We arrived at Adirondack Star Ridge on a Friday afternoon, after a long drive and a short hike. We had enough time before the sunset to meander around a bit and take in the views. From the top of the ridge we were treated to an incredible view of Whiteface Mountain and the Jay Range. No matter where we wandered on the property, the mountains watched over us. The sun sets early in the fall, though, so it wasn’t long before we were forced to head inside and relax. The night wasn’t cold, but it was cool enough for us to indulge a bit with a fire in the woodstove. We opened a bottle of wine, sliced up some bread from the local bakery, and reheated some soup that we brought from home. The kitchenette is perfect for basic food prep. It includes a full size refrigerator, a microwave, electric tea kettle, a coffee maker, and a small sink. There is no stove, so preparing a big meal isn’t really realistic. We brought lots of snacks, yogurt and granola for breakfast, and sandwich fixin’s for lunch. We went out to dinner on our second night. It’s a vacation, after all. The studio is quite spacious, with plenty of room to just relax. It’s essentially one big octagonal room with warm wood paneling and lots of windows. There are two entrances with glass sliders, and curtains or blinds on all the glass if you need some privacy. A small table with two chairs is the perfect spot for your coffee-with-a-view, but there’s also a cozy sofa and a leather recliner that you’ll never want to get out of. The bed is the best of all — situated close to the west-facing window, and covered with luscious cotton bedding. If it weren’t for the lure of the mountains, I would have stayed in bed all day. 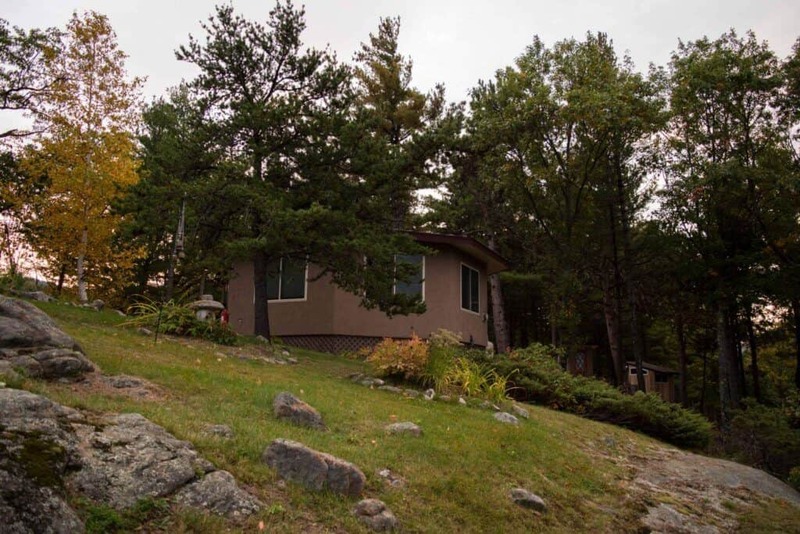 There is no TV, so if that’s important to you, consider the cottage or Star Ridge Ensuite. First, I’ll give you a tiny tour of my favorite spot at Star Ridge. This fire pit, which I heard is being rebuilt as I write this, gets my vote for the fire pit with the best view ever. This is a communal fire pit, and there’s ample seating for everyone. During our stay, we enjoyed the fire and the view with the guests from Little Star, and our host, Mike. Coming together around a campfire is one of my favorite things. Next up, the outhouse. It’s no ordinary outhouse. 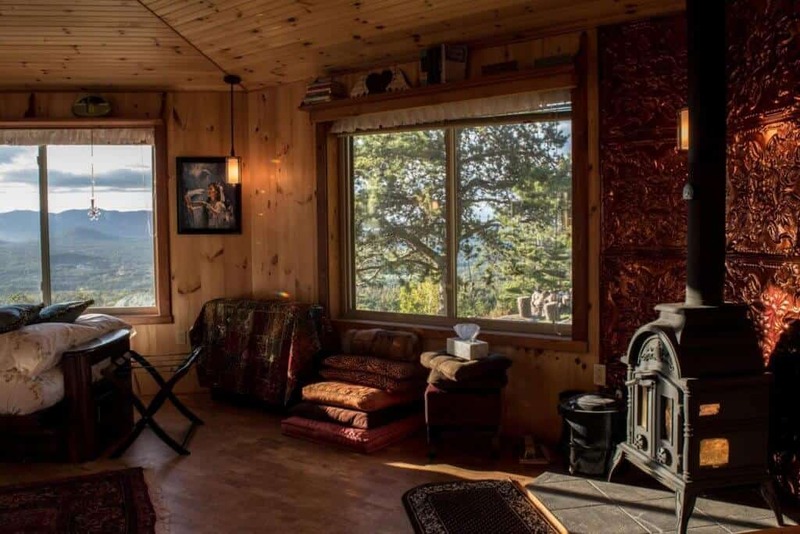 Not only does this one come with a magnificent view, but it also has electric lighting, windows, and heat. If you have to do your business outside, at least you can do it in style. Next to the outhouse is a beautiful outdoor shower. It’s totally enclosed and private, with the same awesome view as the outhouse, and deliciously hot water. 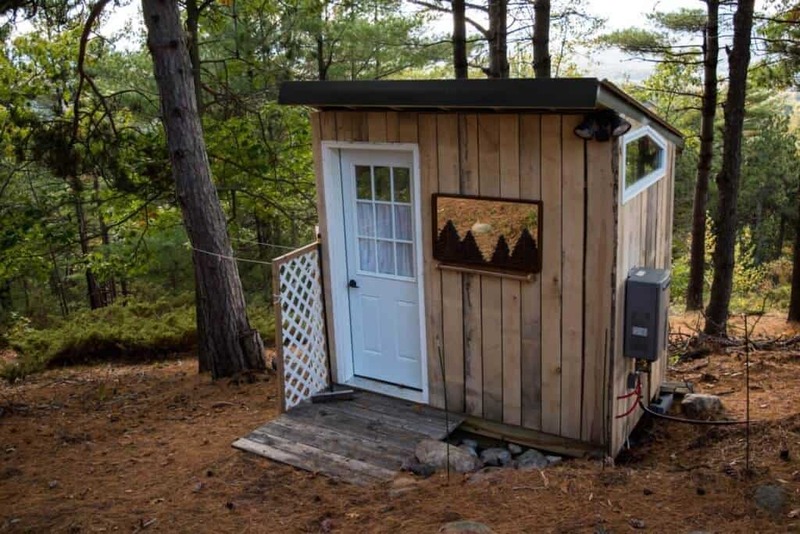 Both the outhouse and the shower are situated on the ridge between the studio and Little Star. They are shared by the guests of both rentals. Mini and Mike went out of their way to make sure our stay was perfectly memorable. They know all the cool places to visit in the area, plus they are experts at building fires and making granola (a continental breakfast and coffee at the main house are provided with your stay). Want total solitude? No problem. Mini and Mike are happy to leave you to your own devices. They are always around if you need them, or if you just want to chat, but they’re also more than happy to respect your personal space. It is obvious that they have put a lot of time and love into creating a beautiful retreat for all to enjoy. They are verified superhosts on Airbnb, and their listings have received 98 stellar reviews so far. 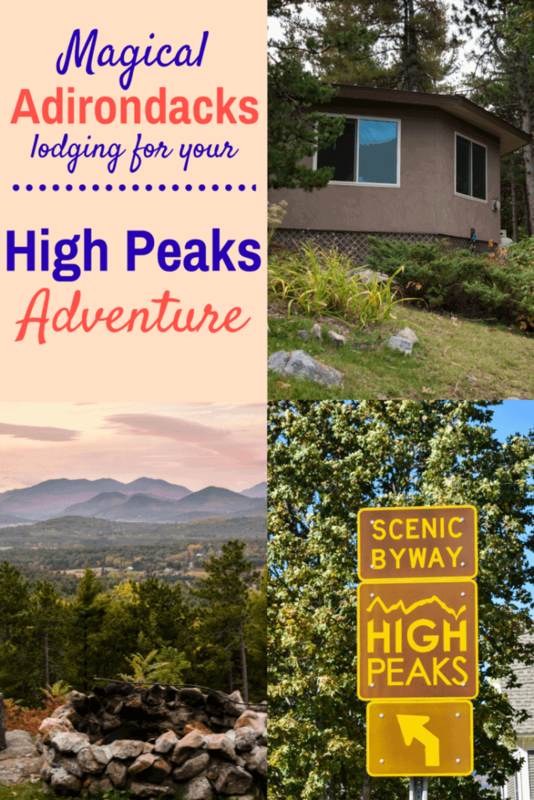 Ready for a relaxing vacation in the Adirondacks? 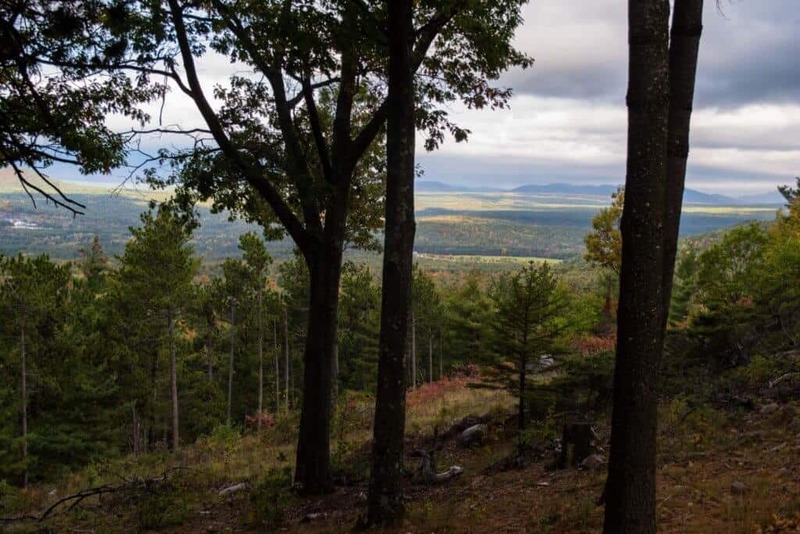 Adirondack Star Ridge is located in Au Sable Forks, New York, which is a five-hour drive from Manhattan. The nearest international airport is in Burlington, Vermont, which is 48 miles away and includes a ferry ride across Lake Champlain. 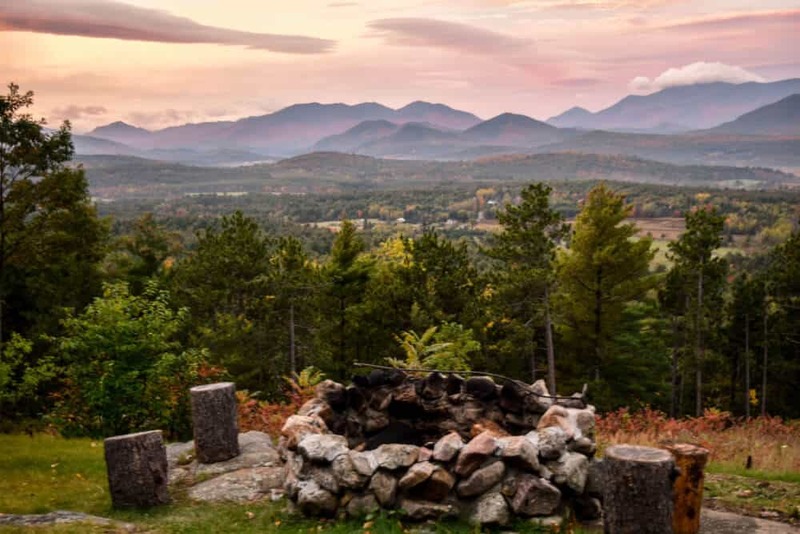 The Adirondack Mountains are a four-season destination, with fantastic skiing in the winter, and great hiking and watersports in the spring, summer, and fall. For a fantastic fall foliage experience, book your stay during the first two weeks of October. All of the properties mentioned above can be booked on AirBnB. 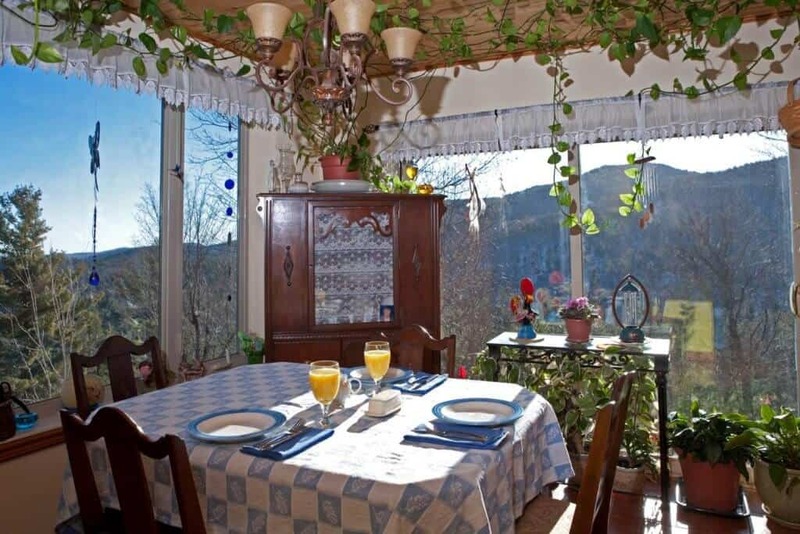 The cottage is the only listing that is available year-round. The rest are available in spring, summer, and fall. Contact Mike and Mini on AirBnB for specific dates. Adirondack Star Ridge looks like a really cosy getaway. I think after a long drive and a short hike, this is the place where I would like to relax and introspect about life! Thank you for sharing a wonderful post! A perfect location for summer and fall, loved the detailed information provided. The hosts seems to be quite gracious and friendly. 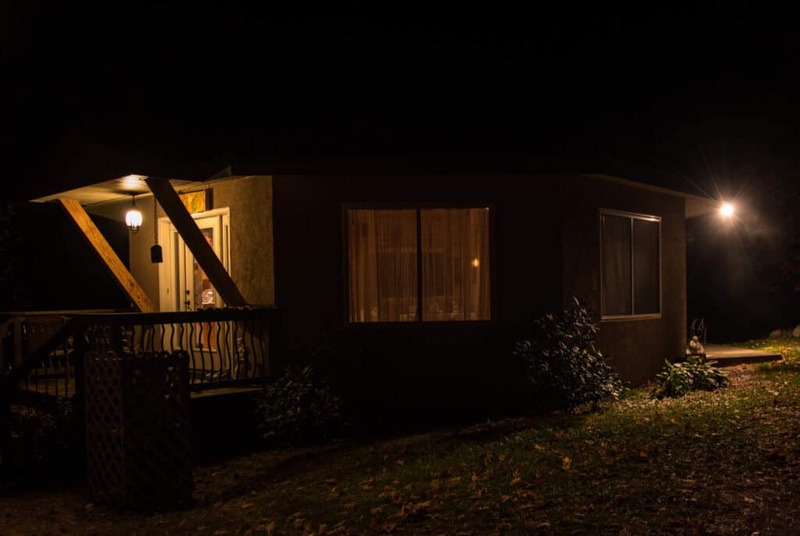 No wonder it is so highly rated on AirBnB. Would love to check out the Star Ridge Studio and hole up there for a few days of detox and get back in touch with nature. Wow! It’s such a beautiful location! And those cabins, they look so cozy and inviting. As a photographer i’m guessing I’d want to be there in the fall when the colors come out to play! Great to know they’re on AirBNB, I’ll have to look into visiting! This seems like the perfect fall getaway! 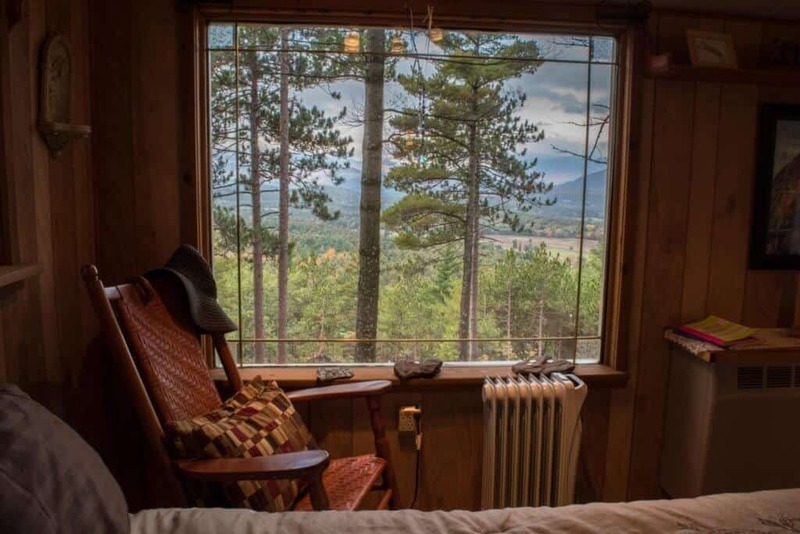 I love all the hiking options and views and ending the day in a cozy little cabin. That’s pretty cool that all of these are available on AirBnb too!